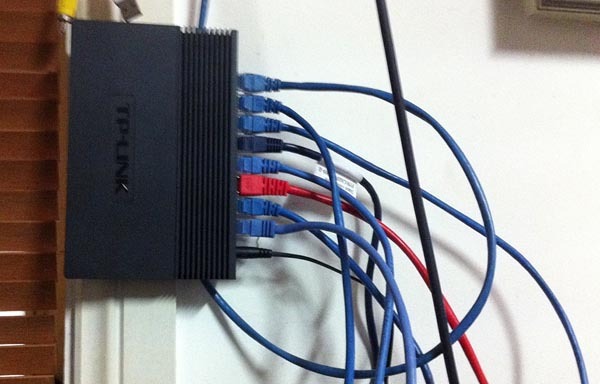 That eight port network switch hovers above my system. One port is connected to the router, of course, and the others to a home theatre receiver, a Blu-ray player, two PVRs, a Telstra T-Box and a PS3, with one left over for whatever I happen to be testing (commonly a TV). Eight ports aren’t really enough. Ideally I’d also have the HD DVD player connected and have wired Ethernet on the other Blu-ray player, rather than WiFi. But network switches take a big step up in price when you go beyond eight. Yup. Almost can’t escape it! I’m using power line Ethernet, which is fine for streaming lossless audio to an Airport Express, copying the occasional files to/from the PVR or to update firmwares! One day will wire gigabit cables but in the meantime (or until there is no choice) this is fine. Does however mean more cables, and power usage, regardless.